Killer Characters: The Buzz on a Book Deal...with a giveaway!! The Buzz on a Book Deal...with a giveaway!! Well, with all the women-folk at the toy shop buzzing around like bees, someone had to man the blog. And although I’m a man of few words, except for the occasional bad pun, I’ve stepped up to the occasion. Why is everybody so bee-sy, you ask? Normally it’s one or two people stopping in, but I guess there’s a limited-time $1.99 special on for the first book, Death of a Toy Soldier, for those fancy new ebook thingies. And everybody wants a gander of the toy soldier that inspired the title. And the paperback of the second book, Murder on the Toy Town Express, in which the author detailed the occurrences at last year’s train and toy show, comes out really soon and is available for preorder. 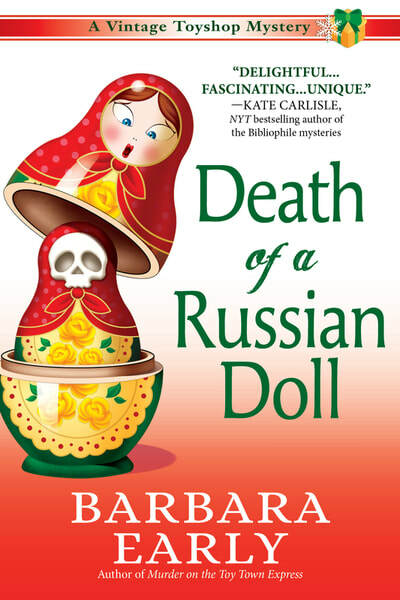 To top it all off, the brand new THIRD book in the series, Death of a Russian Doll, releases in early October, and folks are rushing to order their copies. Not wanting to lose out on a bump in business, we’ve cajoled the author to let us do a little giveaway of our own. Assuming you’ve taken the opportunity to get the first book on sale, we’re giving away one of the spanking new paperback copies of Murder on the Toy Town Express to someone who comments below, telling us something about one of your favorite childhood toys! Please leave a valid email address in a spam-safe format, (ie., Name at provider dot com), so we can contact you if you win! I was hoping we could get the author to respond to comments, but I guess she picked today of all days to move, and she didn’t think she could get here. (Slacker!!) But she said she’d stop back and pick a winner by noon on Saturday, September 1st. My aunt gave me a toy monkey when I was born. His name was Zip. He went everywhere with me and was my confidant. He looks his age, nowadays, which is almost 59! I really love the covers of the three books! I love nesting dolls. They are so much fun still today. One of my favorite childhood toys was a Emmett Kelly clown doll. I played with it a LOT and it was always front and center on my bed with my other stuffed toys. However, as I became a young teenager and thinking I had outgrown toys, I lost my sweet Emmett to an unscrupulous art teacher in junior high school. Having no artistic ability and not realizing the value of my Emmett, he was traded for an A in art class. Later as an adult and while reaching through antique stores with hubby, my desire to find an Emmett doll like mine took hold. I was able to find one similar to mine, but have never been able to find one just like mine. I had my folks old movie camera films to look at for fine details since he was always around. The one good thing that came out of my search for the Emmett dolls was that I actually got to meet Emmett Kelly Jr (also a clown) and through the years with what became as a celebrity/fan because two very good friends. At Emmett's coaxing, Hubby and I even did clowning and traveled several places to clown with Emmett at some of his appearances. Guess it was all for a reason and although I don't have my original doll, I do have tons of wonderful memories of our adventures to find another one. Thank you for the wonderful chance to win a copy of "Murder on the Toy Town Express". Love your books! I loved all the standard toys but the Etch-a-Sketch was fascinating. Not so much that I loved it but that I could hard draw anything recognizable on it (foretelling of my non-crafty talents as an adult I guess) so I tried and tried and tried. Love the puns and love the covers. Thanks for the giveaway. Someone else mentioned the Etch-a-Sketch and I have to second that. We played with ours until it finally gave out. Thanks for the giveaway! My little black singer sewing machine I still have it. It still sews.From the sixties. I spent a lot of time out of doors. Nature was my favorite toy. 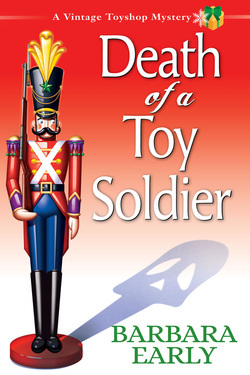 I loved "Death of a Toy Soldier". It's fun reading about all the toys from years ago. I really liked playing with my dollhouse and rearranging the rooms. I loved playing with paper dolls. Loved to change their outfits and imagined them traveling all over the world. Thanks for a chance to win your getaway. I had a train set as a child. A very cool gift for a little girl. brothers would break. After tears were dried up and the boys were reprimanded, “Susie” would disappear! Twice she came back at Christmas with a note from Santa to say she was all healed and he’d picked her up from the doll hospital!